Living with diabetes is complicated. What would you do with FREE time away from some of the daily worries and burden of treating diabetes? FREEDOM-1 is a clinical research study investigating an innovative approach to delivering treatment for type 2 diabetes that doesn’t require needles or even pills. 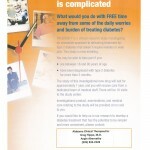 -have been diagnosed with type 2 diabetes for more than 3 months. The study of this investigation new drug for last for approximately 1 year and you will receive care from a dedicated team of medical staff. There will be 10 visits to the study center. Investigational product, examinations, aand medical care related to the study will be provided at no cost to you. 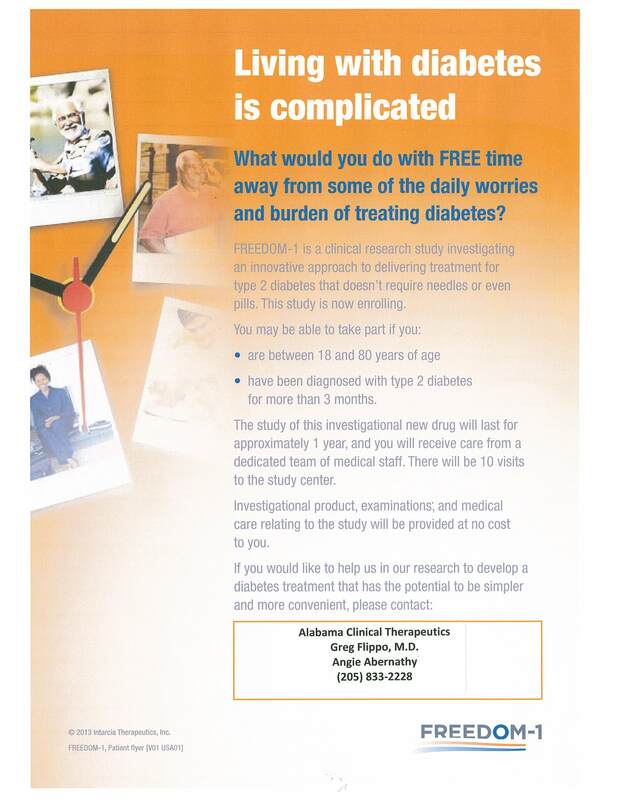 If you would like to help us in our research to develop a diabetes treat that has the potential to be simpler and more convenient, please contact Greg Flippo, MD or Angie Abernathy at Alabama Clinical Therapeutics at(205) 833-2228.